Below are the official 2018 Hockomock League Girls Swimming All Stars, selected by the coaches in the league. MILFORD, Mass. 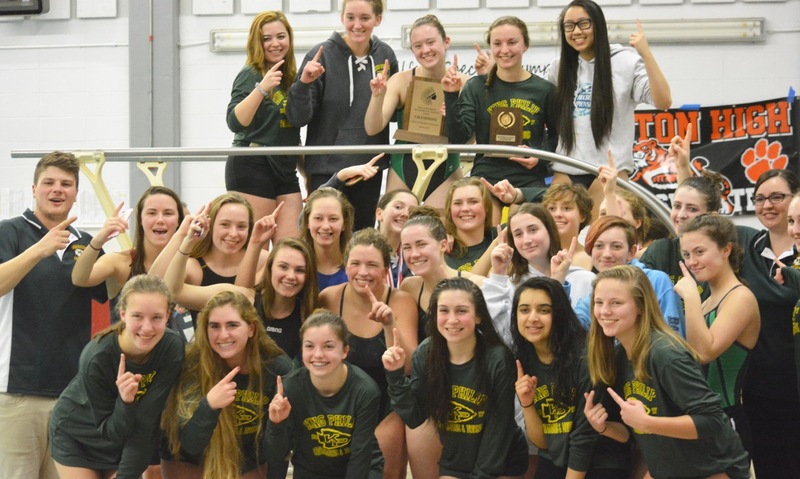 – The King Philip boys’ team won its second straight Hockomock Swimming Championship title on Friday night and on Saturday the girls made it a school double, adding to their Kelley-Rex division title with the team championship at the league meet. KP finished with 317 points, pulling away from Franklin (285 points) and Taunton (282 points) with a second place finish in the final event of the meet, the 400-yard free relay. North Attleboro, the Davenport division champion, and Oliver Ames tied for fourth place with 202 points apiece and Attleboro took sixth on 199. Relays were the key to the boys’ title the night before and it proved crucial for the girls as well. The team of Callie Sullivan, Fahra Whachard, Sam Nasson, and Sam DeWitt took second in the 200-yard medley relay to start the day and the Warriors grabbed the lead for good when Catherine DiGiacomo, Morgan Sachleben, Jessica Sullivan and Whichard won the 200 free relay in a time of 1:49.07. DeWitt, Nasson, DiGiacomo, and Callie Sullivan took second behind OA in the closing race, the 400 free relay, but it earned the points that sealed the title. The Tigers jumped from sixth into a tie for fourth with the win in the final relay. Mia Esterman, Aprille Gangi, Makayla Paquin, and Morgan O’Hara came from behind to edge the KP team by a full second. It was the third first place finish of the day for O’Hara, who made quite a splash in her first league meet, also winning the 100 free and the 100 backstroke. 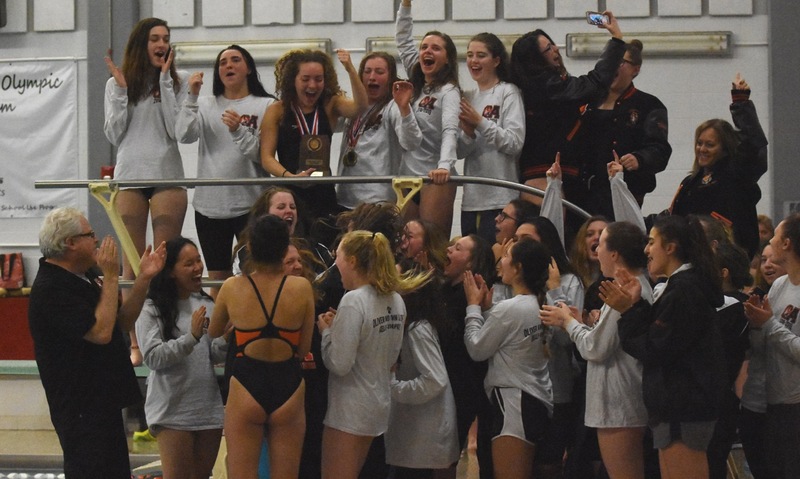 Other swimmers with multiple first place finishes included Attleboro’s Jackie Lynch-Bartek, who won as part of the 200 medley relay and took first in the 200 breaststroke, and Franklin junior Ashley Loomis, who became a three-time Hock champion in both the 200 free and 500 free. Loomis, who is getting looks from Ivy League programs, is also the defending state champion in both events. One of the more interesting subplots to the season was the success of the Taunton girls’ program under first-year coach Pat King, who volunteered to take over the program when the original coach stepped down just two weeks before the start of the season. The Tigers finished second in the Kelley-Rex and then took third at Saturday’s championship meet, which is their highest finish since joining the league. “I’ve coached many years, just never coached swimming before,” said King with a chuckle. “They said what do you think? Of course, I checked with my senior daughter (Jennie King) first and asked if it was okay because I didn’t want to screw up her senior year. She said, go ahead, go for it. Like O’Hara, Sinkiewicz marked her Hockomock Championships debut with a first place finish, claiming the top time in the 200 IM. She also finished second in the 100 backstroke (to O’Hara) and was on two relay teams that had top six times. 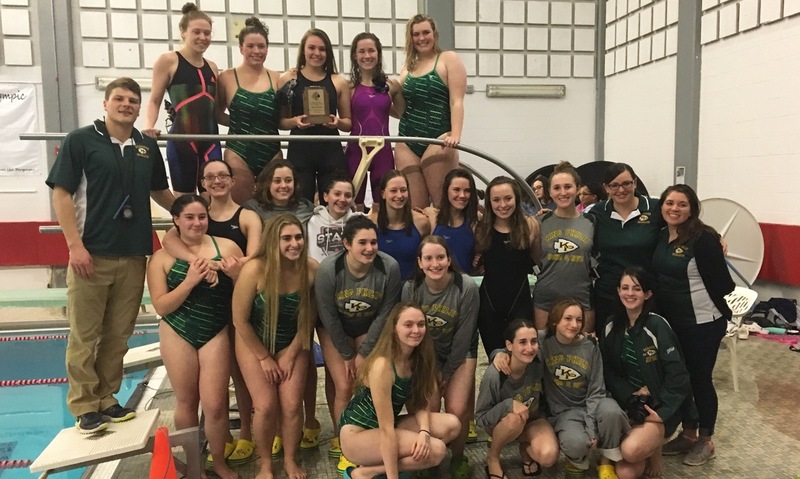 The day (and the weekend) belonged to King Philip and Pettine admitted that the girls came into Saturday wanting to make sure that the boys’ team did not get all the bragging rights.